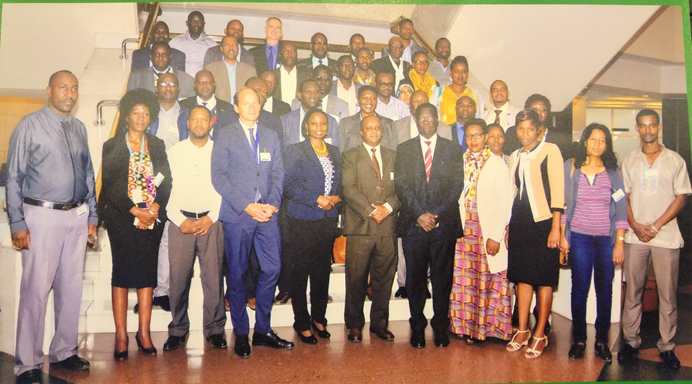 Training workshop on effective land administration in Africa was held at UNECA, 9 – 13th November 2017. The theme was Innovative Concepts, Tools and Practices for Effective Land Administration as a Pre-Conference Workshop of the Land Conference (14 – 17 November 2017) to advocate implementation of Fit For Purpose (FFP) Frameworks in support of the implementation of AU Agenda and Social Development Goals (SDG’s) on Land through Capacity Development. The workshop was organised by Regional Centre for Mapping of Resources for Development (RCMRD), GIZ, African Land Policy Centre (ALPC), UN-Habitat and the Global Land Tool Network (GLTN). The workshop brought together land officials, technical personnel, professionals, academia, lawyers, civil society organisations (CSO) and other actors from across the land sector for joint learning on innovative and effective land administration tools and practices for secure land rights and improved land governance in Africa. The objectives of the workshop were to create a platform for learning and sharing key land administration cases, approaches, achievements and challenges as well as learn innovative land concepts, tools and practices. Furthermore, the participants were taught the innovative tools such as social tenure domain model (STDM), gender evaluation criteria (GEC). In total, there were 30 participants from 14 countries namely Ethiopia, Kenya, Uganda, Tanzania, Burundi, Democratic Republic of Congo, Malawi, Namibia, Nigeria, Rwanda, Sudan, South Sudan, Zambia, Zimbabwe. There were 22 male and 8 female and thus the workshop was able to achieve the 30% gender rule as part of addressing sustainable development goals (SDG’s). The participants were drawn from various sectors including public, private and academia with the objective of strengthening academia-policy-practice linkages/knowledge exchange in land administration. Some of the summary actions from the workshop were: opportunities for strengthening Network for Excellence on Land Governance in Africa (NELGA); the need for in-country follow up workshops on land governance; the need for Massive online course (MOCC) and webinars on the innovative tools; and inclusion of the private sector. In addition, NELGA with the support of the German Government will provide scholarships for land governance students in Africa at Master’s and PhD levels, and will help strengthen ties between African universities, enhance student mobility, and create opportunities for knowledge sharing, research and best practices in land governance. The results of the workshop were presented at the Land Conference 2017 organized by Africa Land Policy Centre (ALPC) at UNECA in Addis Ababa, 14 – 17 Nov 2017, with the theme “The Africa We Want: Achieving socioeconomic transformation through inclusive and equitable access to land by the youth”. RCMRD is grateful for the partnership with African Land Policy Centre (ALPC), GIZ, UN-Habitat and the Global Land Tool Network (GLTN) in scaling up capacity building in land administration. RCMRD plans to have a series of follow up meeting with the various partners in order to sustain the capacity building in land administration including in country follow ups. Story compiled by Dr. Kenneth Mubea, RCMRD.